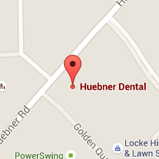 Huebner Dental is a modern dental practice here in the heart of the Medical District in San Antonio, TX, devoted to restoring and enhancing the natural beauty of your smile using conservative, state-of-the-art procedures that will result in beautiful, long-lasting smiles. Dr. Diego E. Rivas practices with a standard of excellence in a personalized dental care, enabling him to provide the quality dental services you and your family deserve. We provide comprehensive treatment planning in general and cosmetic dentistry to help you achieve optimal dental health. As a dental practice, we are true believers that preventive care and education are the keys to ideal dental health. We strive to provide “dental health care” instead of "disease care." That’s why Dr. Rivas focuses on thorough exams and your entire body’s well-being. Building a foundation of trust by treating you as a special individual is vital to our success. We understand how uneasy you may feel about your dental visits, and we can make a difference by providing a relaxing and positive experience. Our entire team is dedicated to providing you with excellent, personalized care and service to make your visits as comfortable and pleasant as possible. We thank you for allowing us to take care of your dental needs and look forward to serving you. Schedule your appointment today; we’ll give you a reason to smile!